Information arrives into the profile card through spreadsheet imports, manual edits, or form submissions. Every time you accept a form submission, the contact's information is automatically updated in the profile card. But sometimes you might have to add information yourself. You can edit and add fields to a profile card by clicking the pencil icon in the top right of the card. Once in edit mode, all fields can be changed. Click on a field and type to make changes. 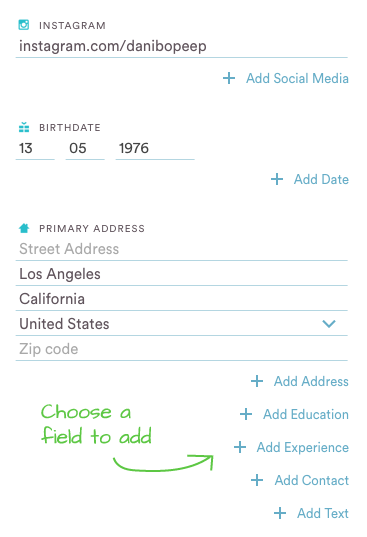 If you'd like to add a new field, scroll to find the field type you're looking for, and click to add. The field will open up with space for you to add required details. When finished, click 'Create Field' to save and add this information to the profile card.